Mozilla has now moved Firefox 29 into beta with a new update. The move will allow the company to iron out any final issues before the overhauled browser hits public release. It is said to be Mozilla's biggest redesign of its multi-platform browser since 2011. 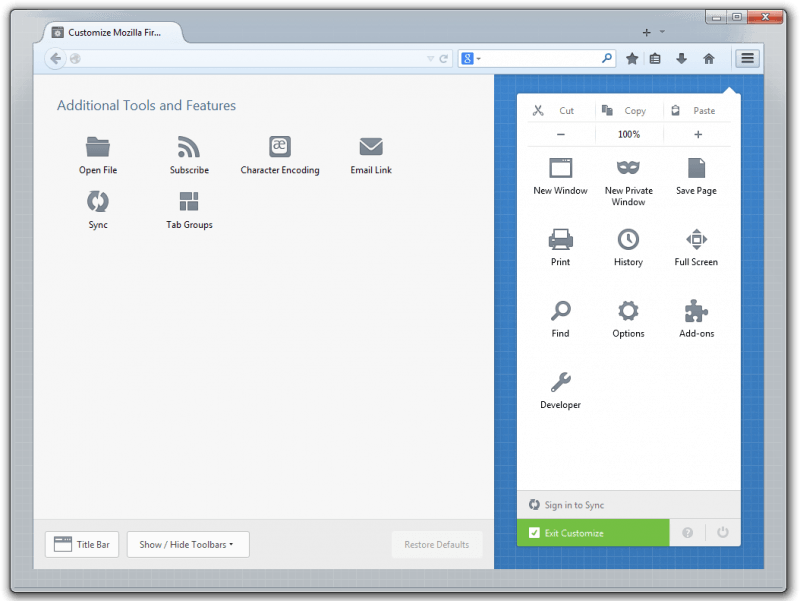 The new Firefox boasts a brand new interface with a strong focus on user customization. The aesthetic overhaul will spread across both the desktop and mobile versions, as the updated UI has a much more touch-friendly design approach to it. The interface tweaks are centered around the new customization mode (seen above) which provides a universal menu where all browser controls, features, tools and add-ons reside. From there a simple drag and drop system allows for particular placement of the various icons and quick links. Mozilla has also upgraded Firefox Sync and is requiring all current users to sign up for another account in order to take advantage of the new system. Mozilla said the "new Firefox Sync makes it even easier to setup and add multiple devices while delivering end-to-end encryption." The new sync feature is currently available for Windows, Mac, Linux and/or Android. Mozilla also said the new version's tabs are a more "fluid and streamlined shape," sit up higher on the page to offer more real estate for your web content, and when not in use are visually de-emphasized for convenience. As others suggest, there doesn't appear to be many major changes between the Aurora developer build in the beta release meaning this is likely a good look at what we will see in the final product when it is expected to release in around 6 weeks time. Those interested can download Firefox 29 beta for Windows, Mac and Linux now.